Intelligence Lapse In U.K. Plot? Were the terror plots in the U.K. a failure of British intelligence? 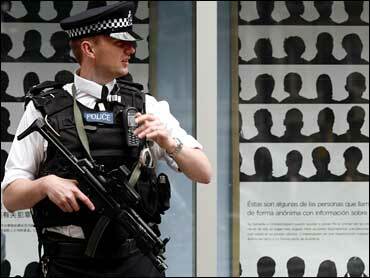 CBS News has learned that some of the current terror suspects were already on the radar of the agency MI5. Sheila MacVicar reports. British authorities brought down the threat level from "critical" to "severe," signaling confidence they have broken down the terror cell responsible for the car bombs found in London and for the Glasgow attack, CBS News correspondent Sheila MacVicar reports. But of the eight suspects in custody, at least three of them were already on the radar of MI5, the British domestic intelligence service. And intelligence sources tell CBS News that Dr. Bilal Abdulla, part of the would-be suicide-bomb team at the Glasgow airport and believed to have driven one of the bomb cars to London, had been under surveillance before the attempted attacks. Meanwhile, more evidence of a possible link between the British car bomb plotters and al Qaeda in Iraq emerged Wednesday, as a respected British church official based in Baghdad said one of the group's leaders boasted to him of plans to attack Britain. Cannon Andrew White is quoted by The Times newspaper as saying an al Qaeda in Iraq leader told him in the spring that "those who cure you will kill you". The quote by White, who MacVicar reports is well-regarded and frequently plays an active role in Middle East issues, strikes an eerie chord in Britain; all eight of the suspects in the plot were doctors or medical workers with ties to the country's National Health Service. White told The Times he had informed Britain's Foreign Office of the general warning from the al Qaeda leader in April, but not the specific wording. The newspaper reported that the Foreign Office was forwarding the exact wording of the threat to police in London who are now leading the investigation. Iraqi National Security Advisor Mowaffak al-Rubaie told CBS News Tuesday that he has been warning U.S. and British authorities "for 18 months" that al Qaeda in Iraq "has been systematically infiltrating operatives into Europe." "Al Qaeda, in last 18 months, has changed its recruiting strategy; it's now targeting highly educated and highly intelligent people, the intellectual capital of the Muslim world," Rubaie added. Intelligence sources tell CBS News that the crucial cell phone evidence gathered from the eight people now in custody also suggests a link outside of Britain, and apart from Australia, where the last arrest was made Tuesday. The call records suggest there may have been an overseas "guiding hand" in the plot, according to the sources. In other developments, the British government said Wednesday that it had reduced the level of the terrorist threat facing the country from "critical" to "severe." The level was raised to critical — the highest on a five-point scale — on Saturday after failed attacks on Glasgow and London, meaning that further attacks were thought to be imminent. The country has not been lower than the "severe" level, meaning that further attacks are considered likely, since August, 2006. In a statement, Home Secretary Jacqui Smith said the reduction "does not mean the overall threat has gone away — there remains a serious and real threat against the United Kingdom and I would again ask that the public remain vigilant." The decision to reduce the threat level was made by the government's Joint Terrorism Analysis Center. Earlier Wednesday, Prime Minister Gordon Brown said the government will expand checks on immigrants taking skilled jobs and review recruiting for the National Health Service, which employed all eight suspects in last week's foiled terror plots. A government security official said several of the men had been on a British intelligence watch list. One of the suspects on the list had posted a comment on an Internet chat room condemning cartoons of the Prophet Muhammad published last year in Danish newspapers, The Evening Standard reported, citing unidentified intelligence sources. A senior U.S. counterterrorism official, who spoke on condition of anonymity because of the sensitivity of the issue, said none of the eight suspects was on any American lists of potential terror suspects. CBS News confirmed that Britain's domestic intelligence agency "was aware" of at least two of the plotters before the two failed car bombs were found Friday morning in London, and a gas-packed Jeep Cherokee was driven into the main entrance of Glasgow's airport Saturday. Sources say the agency, MI5, came across the suspects in the course of an investigation into Hizb ut-Tahir, an Islamic group banned in Britain after the July 7, 2005 attacks. Hizb ut-Tahir claims to be an entirely peaceful organization working to bring Islamic law to the entire Muslim world. It has members in almost every country with a considerable Muslim population. Though the group has not been linked to violence, intelligence experts believe many Muslim men have been radicalized by the anti-Western platform preached by the organization, and then gone on to join militant Islamic groups. Friends of Bilal Abdulla, who was in the Jeep that crashed into Glasgow airport, tell CBS News that he is a former member of Hizb ut-Tahir. The homepage of the group's British Internet site had a statement Wednesday condemning the attempted attacks in London and Glasgow. "Muslims should never stoop to the level of the adherents of the insidious neocon ideology that has unleashed terror on Iraq and Afghanistan," it read, adding, "Islam does not allow the harming of innocent civilians." The men are identified as Bilal Abdualla and Khalid Ahmed. The latter was driving the Jeep, and was still in critical condition Wednesday at a hospital in Glasgow from burns suffered in the attack. Sources tell CBS News that Sabeel Ahmed, in custody in Liverpool, is also a Muslim from India, and he attended university in India with Mohammed Haneef, who was arrested Monday by Australian authorities in Brisbane. British media reported Wednesday that a counter terrorism official was traveling to Australia to discuss Haneef's arrest with counterparts. Sources close to the investigation say two or three more arrests are likely in Britain before the end of the week, and some of those new suspects are likely to be British nationals. Two more suspects, ages 25 and 28, were arrested by police Sunday at Royal Alexandra Hospital in Glasgow. Staff said one was a medical student and the other a junior doctor, without giving their names. British media said they were from Saudi Arabia, but police refused to comment.